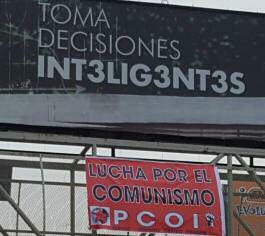 EL SALVADOR, May 1st—“Workers and students, united and moving forward,” “Forward: Communism is coming and no one can stop it,” chanted the ICWP contingent of over 40 people. Workers from other contingents responded to the chants. A group of university students applauded enthusiastically the group of men and women workers from the maquilas. This took place during the march to commemorate International Workers’ Day. Thousands of people filled the streets of the capital. 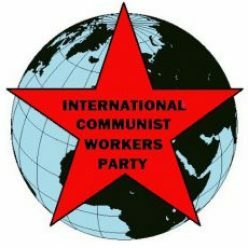 The International Communist Workers’ Party (ICWP) was there with the message: For a Communist, Working Class, Militant, and International May Day. The punctuality and order, the logistics with which we organized our presence at the site of the march, were positive. This shows our commitment to the Party and the revolutionary process. It allowed us to distribute 1,100 Red Flags and 3,000 leaflets. All of our communist literature was quickly distributed due to the large number of workers who participated in the different marches. A new comrade was in charge for the first time of distributing Red Flag in the buses that brought workers from the west of El Salvador. “I wanted to come now because I don’t want to miss the march,” said a war veteran who had come from the mountain to sleep in the city. He continues to think that a world led by the working class is possible, “without lying electoral reformist politicians,” he concluded. Our comrades from the different communist clubs—textile workers, teachers, students, farmworkers—were present under the flags of ICWP. With banners, shirts, chanting communist and anti-capitalist slogans, we commemorated with high spirits the struggle of the martyrs of Chicago. Our message was clear “Fight directly for communism” to end the bloodshed of thousands of workers in the current regional wars and future global wars between capitalist powers, and to avoid the trap of reformism. We are excited to see that new members of the Party—among them men and women, industrial workers and farmworkers—made the decision to go into the streets without fear and show they are fighting for communism. This included young students, and comrades who fought in the guerilla forces during the civil war from 1980 to 1992, and friends who decided to march together with their children. It is important to transmit our communist message to the new generations and keep mobilizing no matter how long it takes so that the revolutionary effort is not lost and, on the contrary, is strengthened and gains greater political maturity. As is becoming a custom, after the march ended, a group of men and women workers went to a tourist center to enjoy pupusas and sodas. A worker who marched for the first time with ICWP said he was very happy to have participated and that now he considers himself a new member. He said he would continue participating in the Party’s meetings. “You all speak very clearly about political things,” he said. This was the first time since the armed conflict that a march here ended with workers and students singing the Communist International and waving the red flags in a plaza taken over by the working class.